On the rear is correct. If it came with demountables it goes on the rear,and non-demountable would have been on RB The very early tire carriers on rear had a round ring,not the "D" shaped one a on later cars. I believe only closed cars could have electrical equipment, and thus demountable wheels in the 1919 model year. If your car is truly a 1919 touring it would not have a spare, nor would it have demountable wheels. According to the list of changes, open cars were approved for demountables starting on May 7 1919. The same is true for starters and generators. I know my 1919 Runabout has those options and was built this day in 1919. I took my car out for a run today to celebrate it's 94th birthday. Was your engine cast made after May 7, 1919? Is the serial number lower than 3068000? If it was my car, it would have a spare tire and tube or if demountable, a complete tire and rim ready to mount with air in it, if needed. Many people have demountables on pre 1919 cars because they are convenient although not correct. If your car was an August build and has demountables, then I personally would consider a rear spare carrier to be correct. Most importantly, the rear frame will have already been factory drilled for the carrier. Mine was built on May 24 and also qualifies as rear carrier correct. Brian, I just want to make sure. Did you mean Aug 1918 or Aug 1919? It would be interesting to see if your frame is drilled. The earlier tire carriers are different than the later ones, so do your homework before you look for one, and good luck. Also check to see if you have 30.1/2 or 21" demountable there is a difference. I have a 30.1/2 bracket but I need and am looking for a 21"
I found out today how convenient demountables are. I had my first on the road flat due to a weak old tire valve. I got that tire changed in less than ten minutes. One thing to watch out for. My sort of worn wrench, rounded off one of my sort of worn wheel nuts, making the quick tire change impossible. From now on, I'm going to replace all 16 nuts with new ones and carry a good fitting wrench. Demountables are useless if you can't demount them. Compare your soft old used nuts to new ones. The difference might surprise you. 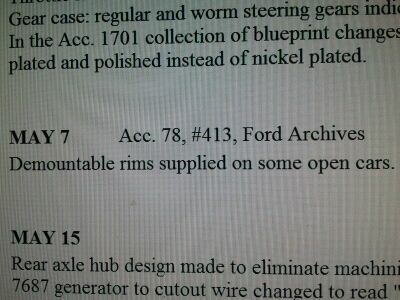 Again, as Jack Daron noted above in his post, a 1919 would need the "full circle" rear tire carrier. These are not as easy to find as the later "D" shaped carriers.